Shekima Lettsome-Joseph, who reportedly stole $44,500 from a client while she was a real estate agent in 2015, pleaded guilty to the offence in the Magistrate’s Court yesterday, March 1. The 32-year-old pleaded guilty to theft, and operating a business without a trade licence. She was also charged with obtaining property by deception. But Lettsome-Joseph did not plead to that charge because the offence is indictable – effectively meaning it may be heard in the High Court. The offender, who the court heard is a law student in the United Kingdom, is being represented by defence attorney Patrick Thompson. During mitigation, Thompson stated that his client has repaid the complainant, adding that the money was not taken to leave the complainant permanently disadvantaged. He further told the court that his client used part of the funds to pay her bills. The defence attorney added that Lettsome-Joseph intended to return the money after she generated more funds. However, things did not go as planned. “She had always intended to make restitution. [She did so] even before the matter reached the court,” Thompson said while he implored Magistrate Ayanna Baptiste-DaBreo not to impose a prison sentence. Lettsome-Joseph will be sentenced on May 31. Reports are that, back in 2015, Lettsome-Joseph presented herself as an agent of a firm called Perfection Realty. 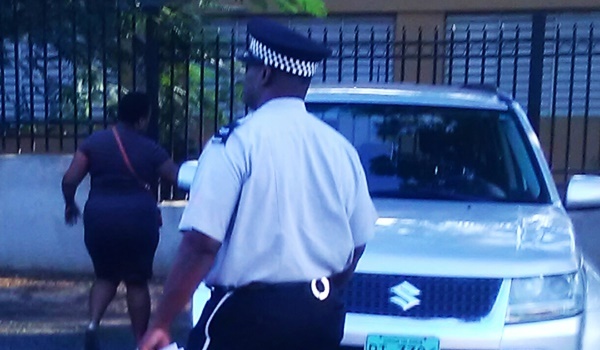 Police officer Earnest Gumbs approached her because he wanted to sell a piece of land he owns at Johnson’s Ghut. Based on an oral agreement between the two, the property was to be sold for $55,000. Of that amount, the police officer was to get $44,500. On March 30 of the said year, the land was sold and the relevant documents signed with the land purchaser in the presence of a notary public. On the following day, Lettsome-Joseph, in a letter bearing Perfection Realty letterhead, reportedly instructed CIBC First Caribbean Bank to prepare a cheque in her name, adding that she is the agent involved in the sale of the police officer’s property. The court further heard that, on April 14 of the same year, Lettsome-Joseph received the funds for the property. It was deposited in her account at Banco Popular. Up to about two months later, none of the money was transferred to the police officer who owned the land. The officer reported the matter to the Royal Virgin Islands Police Force. His colleagues, hours after receiving the report on June 5, went in search of Lettsome-Joseph. She was apprehended and charged. Lettsome-Joseph, in the meantime, was charged recently for another set of offences – forgery and uttering forged documents. She is scheduled to return to court later this month in relation to these offences.